Victraders.com: Oh What A Night! 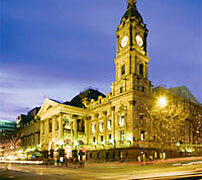 Those of you who have not attended a Council meeting at Melbourne Town Hall May wish to put it on the agenda sometime. It can be an intriguing experience. Last night’s Future Melbourne Committee (A special Committee that implements Council matters) we started off with questions on a very personal sexual harassment issue which has been in the press recently, moved on to an application for development of a heritage car showroom up on Elizabeth St. (Yes, car showrooms have been around long enough to gain heritage status) and then to the issue that was most relevant to the QVM community - Infrastructure and car parking at QVM. For the QVM matter there was a presentation by city design chief Rob Adams followed by a number of speakers who are each given 3 minutes to have their say. Presentations were made by Stan Liacos, Leah Moore, Bruce Pham, Greg Smith, Matthew Vitale, Paul Ansaldo, and Marshall Waters. It could be said that all but one of those was positive and supportive of the proposal. Paul Ansaldo was supportive of investment but questioned just how logistics were going to work for Fruit & Vegetable traders. The need for close consultation with traders was clearly identified in a number of comments throughout the night. Bruce Pham managed to showcase some of his socks as he presented in favour of spending money on our market. Marshall Waters introduced some mirth as he compared QVM Renewal with Brexit, and urged that we get on with the job. George Milonas was mentioned for his written submission asking that we "move forward." There was clearly lingering disappointment in some quarters that the first proposal for an underground facility didn’t get across the line. Arron Wood, Marshall Waters and others considered that was the best for the market in the long term, but we move on, and it was agreed that the new proposal achieves much of the same intent for better infrastructure. A unanimous decision by the Futures Committee to accept the QVM Infrastructure and Car Parking proposal was a very positive outcome. For those who want to get on with the job at QVM, this was a great night.